We Offer World Wide Shipping!!! Custom, Metal & Classic Guitars uses UPS to ship most of our orders. 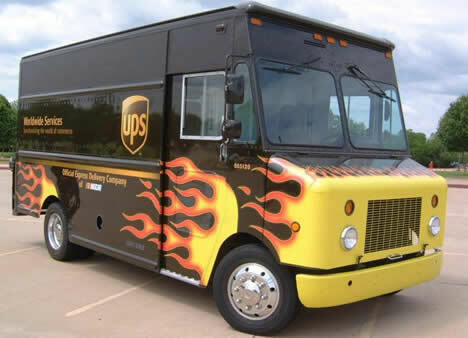 We have had great success with UPS so you can rest easy that your purchase will arrive in perfect condition. For International Shipping we also use DHL, FedEx, and the USPS in addition to UPS, depending on cost and the options available for the package destination. For International Shipping please contact us first for the best rates and to see if the item can be shipped internationally. For all US Domestic Shipping we give you several UPS service options at checkout. Each option has an additional fee based on the weight and dimensions of the package and how quickly you want to receive your package. Before you complete your purchase you can calculate the exact cost for each option. If the item is eligible for free shipping, and you choose that option, the order will automatically ship UPS ground. FREE SHIPPING is available on all purchases over $50 on all items in our store. They are shipped via UPS Ground service at no charge, except where indicated. There are some exceptions for larger items that weigh over 40 lbs and items that ship out of the Contiguous U.S.
NO SALES TAX!!! (exception: NJ 7%) Read Further for Taxes on International Shipping. INTERNATIONAL SHIPPING is available on many items in our store, however some of our manufacturers do not allow certain products to be shipped or sold internationally. VAT Taxes or Customs Taxes may apply to international shipments. We do not calculate them into our shipping costs nor do we know what they will be because they differ between countries. They our your responsibility to pay. We recommend that you contact your local customs office to estimate the taxes on your package. In some cases we also require additional information to verify credit card and shipping billing information. This is due all of the international credit card fraud. So if we ask for additional verification of your shipping and billing address don't be offended. It is nothing personal. It is for both our protection. For all these reasons we require direct contact with you for all international shipping prior to allowing an order to be placed. UPS TRACKING NUMBERS are provided after your purchase is completed, and when the order has actually shipped. You will receive a confirmation via email with a UPS tracking number you can use to track the status of the package. DELIVERY TIMES will vary. We will estimate shipping and delivery dates for you based on the availability of your items and the shipping options you choose. Depending on the shipping options you choose your delivery times may vary. Our warehouse is located in New Jersey so deliveries going to the west coast will take longer via UPS Ground than those orders placed in the Norther Eastern US. SHIPPING RATES on most items are dimension and weight based. But most items ship for free via UPS Ground unless you choose to expedite your shipment, is a larger item and or is being shipped internationally. The weight of any such item can be found on its detail page. To reflect the policies of the shipping companies we use, all weights will be rounded up to the next full pound. 3-4 WEEKS DELIVERY TIME is indicated in the shopping cart for items that are back ordered. Many times the item will be in stock sooner. But you can still purchase those items and we will ship them as soon as we have them in stock. For a more definitive ETA feel free to give us a call. We understand that sometimes the the gear you buy just isn't the right fit. At CMC Guitars we want happy customers and we pride ourselves in making that happen. Just contact us for a Return Authorization Number and you may return your items for a refund within 14 days of delivery provided that the item is in the same condition we sent it to you in and that it is not a custom order, oversized or overweight item, discontinued product, close-out, used products, trade-ins, or layaway. We will provide you the return shipping label. Deposits on Layaway items are non-refundable. All returned items must be complete, unregistered and in the original condition and packaging with all accessories and complete documentation (Owner's Manual, Warranty Card, quick start guides, hang tags, and included accessories like tremolo arms or power adaptors etc. ), show no signs of wear or use and include the Return Authorization number provided by your sales person. If the return is a result of our error (you received an incorrect or defective or damaged item, etc.) we'll also pay the return shipping costs and you will receive a full refund. Otherwise you will be responsible for the shipping charge for the return of your item, and if your item qualified for Free Shipping on its way to you, this shipping charge will also be deducted from your credit card. We thoroughly inspect and carefully pack every item for shipment. If you believe you have received a damaged or defective product, we must be contacted within 3 days of receiving the item. Instruments and other equipment returned to us with pick marks, "buckle-rash", or any other damage or evidence of use may be subject to a restocking fee of up to 25%. We reserve the right to refuse any return if we determine the item has been misused. If you need to return an item, simply email us at info@cmcguitars.com or give us a call at 856-794-3464 for a return authorization. Please do not ship the item back without talking to us first. That will only delay the return process. Items that are damaged in shipping may require the shipping carrier to come inspect the item and pick it up directly from you. You should expect to recieve your refund within three weeks of giving your package to the return shipper, however, we strive to issue your refund sooner than that. This time period includes the transit time for us to receive your return from the shipper (2 to 7 business days), the time it takes us to process your return once we receive it (1 to 3 business days), and the time it takes your bank to process our refund request (3 to 5 business days). American Express, starting November 30, 2010, charges a 3.5% fee for refunds on for purchase made with American Express cards which you will be responsible for too. We want happy customers. So just let us know and we will make it right.